Don't put a fork in him just quite yet, because this turkey isn't done tearing up the town. He's getting ready to fly over to the club and bust out his best funky chicken dance. It's not everyday that you see a turkey doing the famous funky chicken dance move, but when you do, you have to stop and stare. You'll steal the show when you flap your feathers. You'll be everyone's Thanksgiving amusement when you get your gobble on! What makes Thanksgiving a great holiday? Some say it is being with your family having conversations about what's going on with each other. Those who say that are wrong because this holiday is all about the turkey. If there is no golden cooked bird on the table then that holiday is ruined. 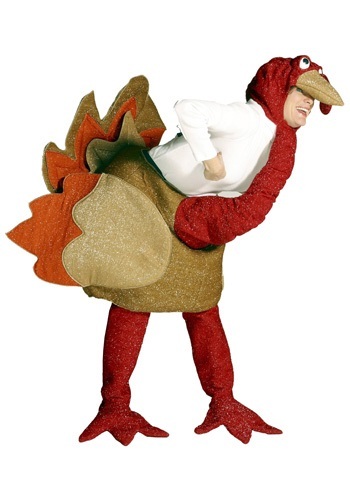 So make sure that your Thanksgiving for sure has a bird some sort at it be sure to pick up this great Gobbler the Turkey costume. Did you ever notice that sometimes the babbling sounds babies make as they're learning to talk sort of sound like a turkey's gobble? 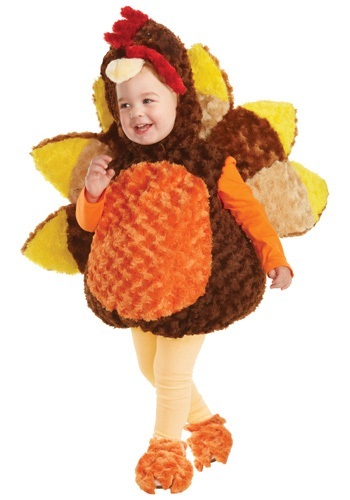 If you have, then you can understand why this Infant Gobble Gobble Turkey Costume is entirely appropriate. It's also cute and cuddly. Gobble! He may not be able to gobble just yet, but he's working on it! His first feathers have just started coming in so that's reason enough to celebrate. Isn't that way there's this huge dinner? Oh, I see. Well maybe we'll just slowly move him away from the table ... we wouldn't want anyone to confuse him with the real bird. 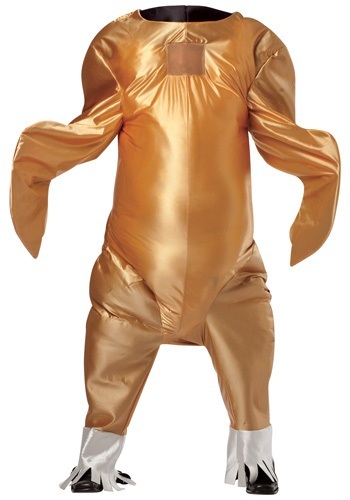 Get to gobbling when you wear this Kids Turkey Costume. 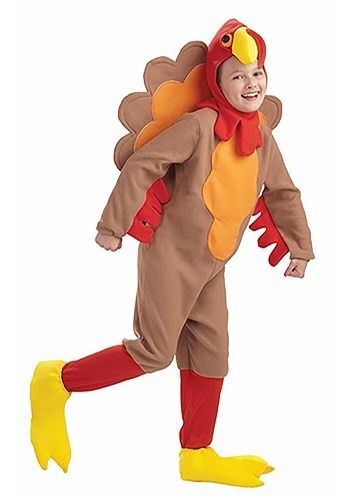 Now your child can give thanks while dressing up as the holiday's mascot! Your child will be more eager to learn about the holiday when they're dressed in this colorful turkey costume. This costume is idea for plays, parades, and for wearing on Halloween! Year after year you've escaped the axe and the unfortunate fate of becoming Thanksgiving dinner. That's how you've came to be the biggest turkey on the farm! Practice your gobbles and be ready for an epic time. 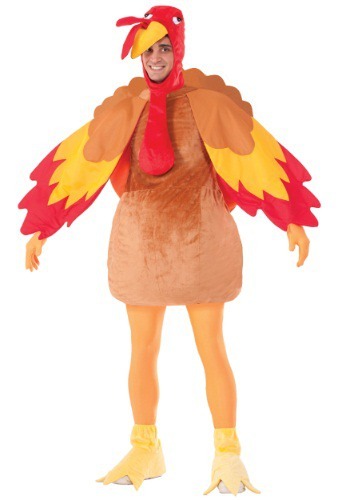 You'll really be the big turkey that no one ever catches in this costume! Most people like Thanksgiving because they get to eat a lot of food and get together with their family, but anyone who's ever dressed their child up in a turkey outfit knows that the best part about Thanksgiving, is that it gives you just one more reason to dress your kid up in adorable outfits. When your little one starts gobbling in it, you'll know exactly what we're talking about. After Halloween every year you'll start to notice that turkeys go into hiding. That is because their least favorite holiday occurs in that month, Thanksgiving. Why do these birds hate that holiday? Because if they don't hide they chance becoming someone's dinner on that day. 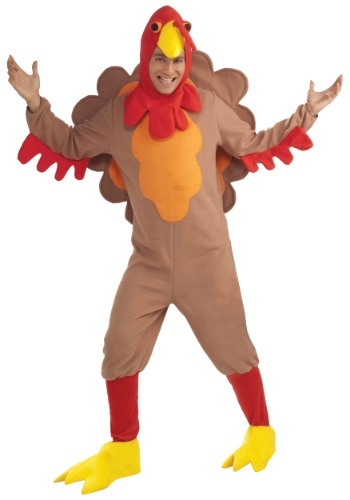 So now you can become this holiday bird in this great turkey costume. Just be sure to watch out for hunters and pilgrims.